Here we go, y’all! 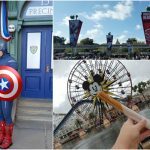 One of my all-time favorite interviews happened last weekend while I was in Los Angeles when I had the amazing opportunity to sit down with Larry the Cable Guy (voice of “Mater”), Nathan Fillion (voice of “Sterling”), Isiah Whitlock Jr. (voice of “River Scott”), and Lea DeLaria (voice of “Miss Fritter”) for a chat! I have been a long-time fan of Larry The Cable Guy and loved Nathan Fillion as Castle. I am a fan of Isiah Whitlock Jr. in The Wire and probably a little too fond of his “signature line”. Then there is Lea DeLaria, who I adore in OITNB and all of her activism on social media! Oh, how I wish I could watch OITNB more….if only it was kid friendly OR I was still young enough to stay up past 10 p.m. LOL Any way you slice it; this was going to be an EPIC interview! The first questions began to be asked: We heard that Larry the Cable Guy does a lot of improv with his Mater character, but we wanted to know if anyone else did any improv while they were recording. 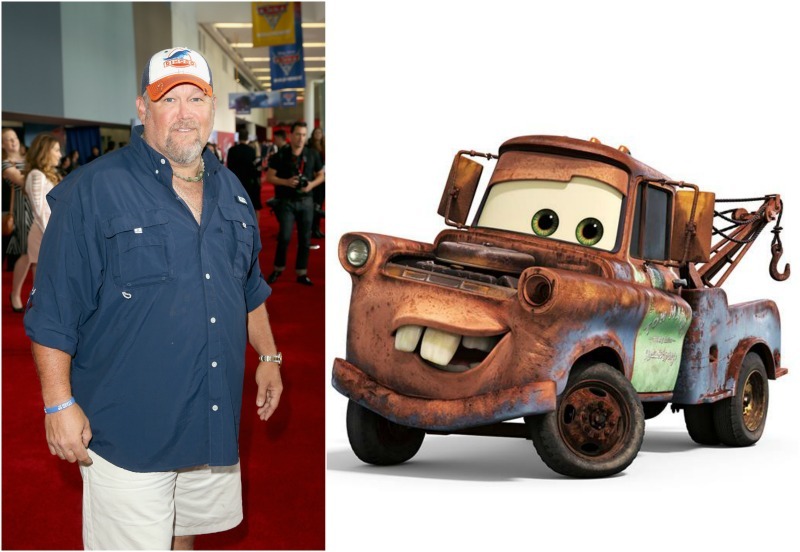 Larry The Cable Guy: Well, I always do improv, from when we did the first one (Cars film). I remember when I first did it, my opening line that I ever did in Cars was “my name’s Mater, like Tomato, without the To”. Of course, I remember, going, “Hey. My name’s Mater, just like To-mato, without the To!” And he was laughing. And I go, “Well, can I do it another way?” No, he goes, “No, do whatever you want, as long as you’re staying close to the script” and so that’s when all of the “dadgum” and “gee!” — that’s when all of that stuff coming about. Isiah Whitlock Jr.: I always say, look, I’m just gonna start talking, cut me off when you’re ready to cut me off. Just tell me. Just tell me to stop, okay? Question: How did it feel to do something different than The Wire [Isiah]? Isiah Whitlock Jr.: Great. I always jump at the chance to do something different. Different characters. And this opportunity came along and I was just thrilled about it. It was totally different. I was in the booth by myself with my own imagination, and I found it quite liberating. Just laying down the voice, and everything like that. But to me, that’s kind of what keeps you going, is that you’re not always playing the same thing, over and over and over again. And even when I’m doing that, I can always find something about the character that’s gonna be kind of interesting. So that’s what I try to do. Question: Nathan, I read something in a different interview where you’d described Sterling as “charming.” He kind of felt a little slimy to me, so what part…? So I think that’s where it gets a little skeevy. Question: Nathan, you’ve played some memorable characters on TV [Mal on Firefly, Castle, etc.]. And you’ve also voiced some characters [Johnny in Monsters University, The Green Lantern on Robot Chicken]. What do you think your favorite part about Sterling is? What called you to this? Nathan Fillion: What called me to this is an opportunity to work with Pixar. I’m not going to lie to you guys. I’ve been to the Pixar facility twice. I’ve seen every Pixar movie. I’ve seen the Pixar documentary four times. I am into Pixar. Nothing happens in a Pixar movie by accident. They tell the story, one pixel at a time. It’s very, very careful filmmaking, and it’s very methodically planned out, and to be a part of it, you know you’re going to be a part of a story well told, and it’s going to be beautiful, and it’s going to last. It’s going to be a story that lasts. So, over and above anything else, I will do anything for Pixar. And, point of fact, I actually did some janitorial work for them two weeks ago. I’m not picky. Larry The Cable Guy: And he was charming while he did it. Isiah Whitlock Jr.: And skeevy. Question: Do you have a favorite part, either your character, or anything in the film, that is your favorite? Nathan Fillion: Listen; when you do a Pixar movie, right before you do the PR stuff, and all of this publicity stuff, they put you in a beautiful room to watch the movie. There’s a big party. Some people get dressed up as their characters. It’s really, really wonderful. There’s lots of food and drinks. At least, I imagine that’s what happens. I had to work that day, so I missed it. Isiah Whitlock Jr.: I take that back. I did. Nathan Fillion: You did see the movie? Isiah Whitlock Jr.: Yes. Yes. I did see it. Nathan Fillion: Is it good? Isiah Whitlock Jr.: Yes. Yes. Nathan Fillion: I knew it. I knew it. I was glad I brought my sunglasses with me, so I could put those on, and pretend like I was just sitting cool in the movie theater. But I did see it, and I found it just extremely emotional. I think the story’s going to be powerful. Question: There is a mentor, mentee relationship theme in the movie. Who are some of your mentors, either professionally or personally? Nathan Fillion: Bob Woods, who played my uncle on One Life to Live. I wouldn’t have moved to Los Angeles without his sage advice. Larry The Cable Guy: You know what’s crazy? That’s my mine too (laughing)! Nathan Fillion: So odd (laughing). And he says, “I thought you were great. You got to get out of Minnesota, man. You got to go to New York, and you got to start knocking on doors.” And I thought, knocking on doors? What? Just going around to people’s apartments? Just knocking on doors? I took him literally. But then he said, “look at all of these monitors.” He said, “Someday we’re going to be able to talk to people and do our banking and — ” and I said “This guy is really nuts.” — and that all came true. But the one thing he told me, he says, “If you really want to be a great actor, you’ve got to start studying psychology. You’ve got to know the human condition. You’ve got to know how people tick, and how you can figure out all of these characters,” and so I thought, Okay, I’m gonna try that. And I studied psychology for about two years. And I just play a bunch of characters who’ve got problems. (laughing) But it was some of the best advice I had ever gotten. And when people talk about mentorship, I always think about this one, this guy, because it’s — I really did sort of learn about the human condition, and how — what makes people do what they do, and how they believe that, you know, they’re right in what they do. So, that was some of the best advice I’d ever gotten in my life. Question: How has social media changed what you do? Another blogger had been talking to you and Larry on Twitter today. Larry The Cable Guy: Well. You know. Social media it’s a good way to talk to your fans. As a comedian, we’ve got Facebook, but my Facebook has over five million people on it, and I always keep that updated. I always keep stuff funny on it. You want people to come to your Facebook. It’s become your new website, you know. I have a website, Larrythecableguy dot com. I don’t really keep it up, but not as much as I do that, because everybody is going to Facebook. Everything on Twitter I love, because Twitter is not as many people, and you can communicate with everybody. So, I mean I have almost 500,000 on Twitter. But, you know, if you check it like I do all the time, I mean, when the kids go to bed, when my wife goes to bed, that’s when I pretty much just hang out on Twitter and talk to people. 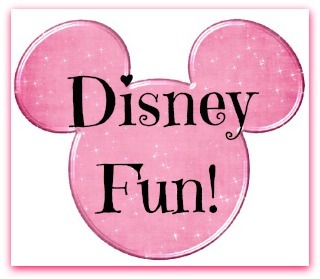 It’s fun, you know. So, it’s manageable, and you can talk — like, I got your message. I can generally talk to most people. Now, if I’m on there after something and you do something and, say, after my History Channel show, whenever that would air, there’d be 500 messages. You can’t get to those. But, generally, if you check it once every hour and a half, you’re going to have 17, 18 messages. You can pretty much answer everybody. I think it’s awesome. I think it’s really cool that you can actually get responded to by a celebrity. I mean, if back in the day, when I was coming up if I could actually go online, and my favorite baseball players or my favorite actors would actually send me a response, I would be a fan for life. And I think that’s the cool thing about social media, and I always try to stay engaged, as much as I can. Nathan Fillion: I’m gonna completely agree. Engagement is a fantastic word. Because it’s a way to engage with your fan base, that doesn’t revolve around work or any publicity. It’s stuff that you’re entirely in control of, so you can personalize it as you wish. You can share, you can be personal with it, you can share your private things, you’re entirely in control. But it is one-on-one. There’s nothing in between you and the fandom at that point, so you can engage with your fans, one-on-one, or just kind of get a general idea of what everybody is about, but I love that word. Engagement. You can engage with people. And I couldn’t do that when I was a kid. Larry The Cable Guy: No. Larry The Cable Guy: It’s awesome. Nathan Fillion: Because, I do that, as an adult, and I get to meet him and hang out with him. Question: Can you share how you became involved in the project? 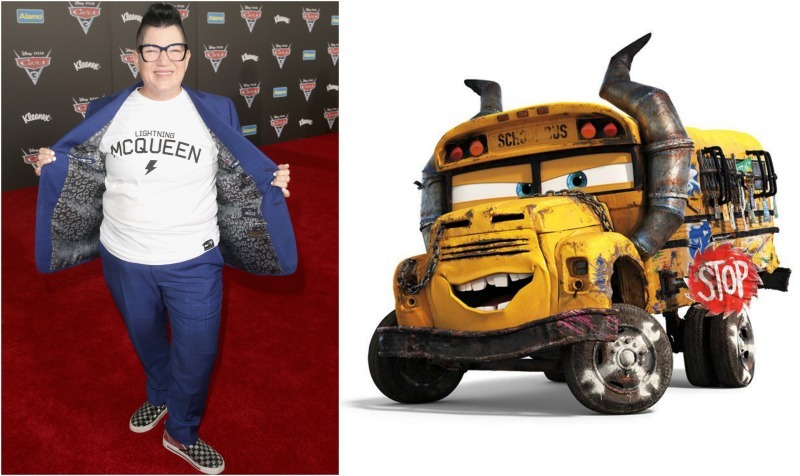 Lea DeLaria: They called me. Question: And why you wanted to do it? Lea DeLaria: Why would I want to be Miss Fritter? Have we seen her? She’s awesome. I mean, come on. Her stop sign is a buzz saw. She’s terrific. Also, I grew up where they do stock cars. I grew up where demo derby was a big deal. I grew up in a really small town on the very tip of Illinois that’s right by Kentucky. So that was like, a Friday night entertainment for me. So the idea of being the queen of the demolition derby? Awesome. And they let me say the high school that I went to. A shoutout to that. That’s the side of the bus is the high school that I went to. Which is, I mean, the people of Belleville, Illinois, which is a tiny little town, they’re gonna go nuts when they see that. It’s kind of awesome. And so when they came at me and said “do you want to do this?” I was like, “Yeah. I have a really good idea of how to play her.” And they were all in and, as was I, so, it was awesome. Question: You have a lot of interaction with your fans on Twitter. How do you fit that in between all the other things you do? 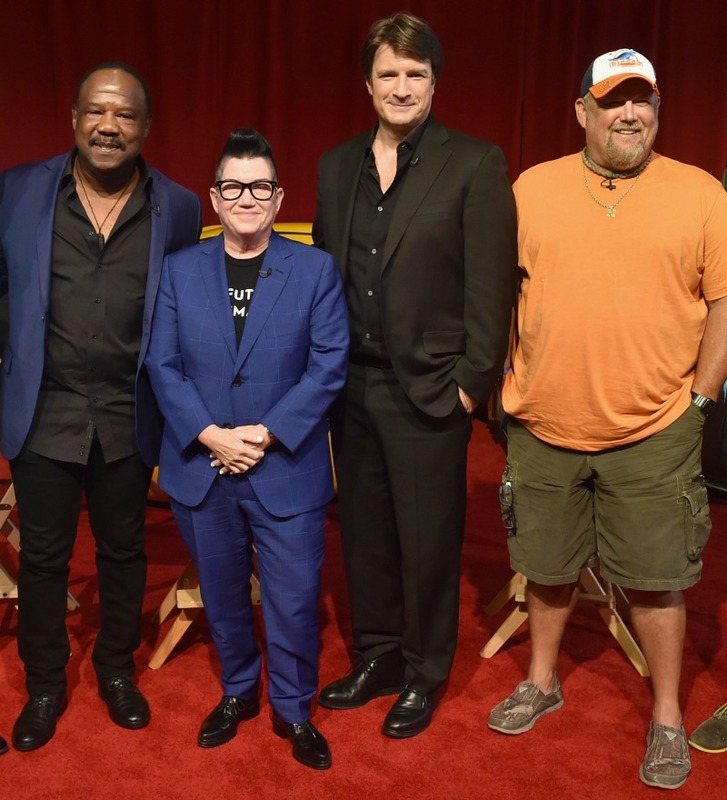 Lea DeLaria: I feel the same way these guys feel about engagement with my fans. I mean, I’m a little — but I’m not 110 years old, so I’m more over at Instagram. That was a shot. I go on Twitter more as an afterthought, and it is — it totally is, I mean, you can go on social media, and see how it tears down. My fan base, because of Cars and Orange is now a much younger base than I used to have. I’m a lot older than people realize, so they’re on Instagram. So I reach out a lot on Instagram, I post every day, I try to respond. Especially, they direct-message you, so only you can read it and no one else on Instagram. So, for that, I mean, just in terms, politically for me, as an openly gay activist, I get a lot of people that direct, that DM me, about problems, you know. Which I take very seriously. And I’m the same way. I try to keep up on it. I can’t do it every hour, every half hour. I actually have someone now who helps me with my social media, because it’s just gotten a little out of hand. But I think that it’s the best way to reach people, and also, it’s a great way — Twitter is a great way to keep up with the president (laughing). Blindsided by a new generation of blazing-fast racers, the legendary Lightning McQueen (voice of Owen Wilson) is suddenly pushed out of the sport he loves. To get back in the game, he will need the help of an eager young race technician, Cruz Ramirez (voice of Cristela Alonzo), with her own plan to win, plus inspiration from the late Fabulous Hudson Hornet and a few unexpected turns. Proving that #95 isn’t through yet will test the heart of a champion on Piston Cup Racing’s biggest stage! Directed by Brian Fee (storyboard artist “Cars,” “Cars 2“) and produced by Kevin Reher (“A Bug’s Life,” “La Luna” short), “Cars 3” in theaters NOW. CARS 3 is in theaters everywhere NOW!